Sail & Dive is a new way of diving and basically means “don’t worry, we will meet you on dive site” or “just tell us where you are and will pick you up directly from your yacht and take you diving” style of diving. Sail & Dive kind of diving is perfect way to get few dives while sailing through beautiful Kornati archipelago and especially comes handy, if you spend holidays with non divers unwilling to sit and wait in the marina all day long for you to come back from the dive. the Dalmatian coast in northern part of Marina Kornati in Biograd na Moru. 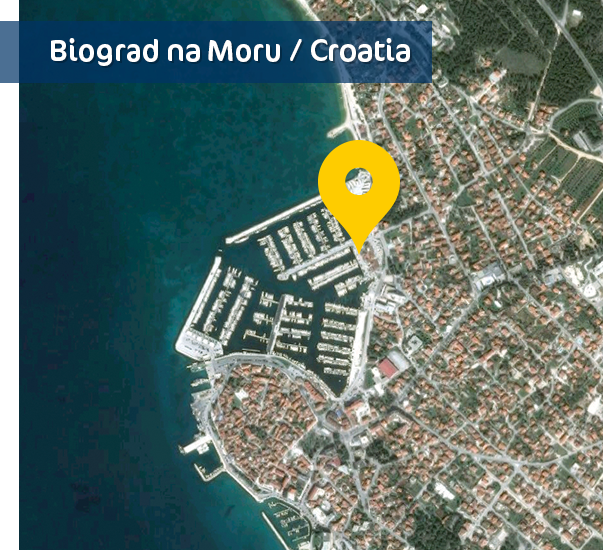 We are easilly reachable by car, bus or airplane (airports Zadar 25 minutes and Split 1 hour). Diving center Just Dive is Padi Dive Resort and PSS center. Within 40 mins of easy »stroll« by our speed boat Donzi, we can reach best diving spots in Croatia. An amazing underwater world of Kornati island national park is considered as one of the top world attractions . Our daily boat trips take us to the spots between islands Pašman, Žut, Murter and Kornati. We dive around 25 different dive spots with all diversity of underwater world and heritage. We operate high quality and professionally maintained equipment by MARES. We place great emphasys on safety and comfort and in fullfiling our clients special wishes. Professional 7,5 m RIB ‘’Donzi’‘ is specially equipped for 12 divers. Made by AB inflatables and powered by 250 HP Honda, Donzi can easily glide at 25 knots, thus shorten the time to destination. Diving trips includes on board refreshmets. At return and after washing all of the equipment can be stored on guarded diving center premises until the end of your hollidays. There is also a sitting area in front of the diving center where you can relax, fill in your logbook and share experience with other divers. As a Padi Dive Resort and a PSS center we teach by Padi / PSS standard from beginner (OWD Open Water Diver) to professional level (Dive Master).